At Dentistry on Vine, our professional team is readily available to assist you with any questions or concerns. Every day in our office we speak with our patients to answer any questions that they may have regarding the health and maintenance of their oral condition. Listed below for your reference are a few questions that we are asked often. If you would like to discuss any of these questions in more detail or if you have dental questions of your own, we invite you to contact us. Why Would I Choose Dental Implants for My Missing Teeth? What Is Periodontal Disease and How Can I Avoid It? I Have Seen Tooth Whitening Advertised on TV and by My Dentist. Is There a Difference? Is There a Connection Between Diabetes and Oral Health? Replacing your missing teeth does not only improve the look of your smile, it can also stop teeth from drifting out of place, improve your speech, and allow you to eat a wider variety of foods. Implants are one of several options for replacing missing teeth. Implants consist of a titanium post and a crown or replacement tooth. The post fuses to the jaw bone, acting like the root of a tooth. This permanent attachment means that implants more closely resemble your natural teeth. It also means that you will not have to deal with loose-fitting dentures or the mess of denture glue. For patients who prefer dentures, implants can be used to anchor them more securely in place. To learn more about dental implants, contact a member of our team today. Periodontal or gum disease is caused by a buildup of bacteria at the gumline. This bacteria, called plaque, eventually hardens into tartar. When the tartar is not removed, it can lead to an infection that may eventually break down the gum tissue and spread to the underlying bone. In extreme cases, teeth can loosen and fall out. Bacteria can also enter the bloodstream through the gums and lead to other serious health problems. Good oral hygiene can help prevent gum disease, but regular dental check-ups are essential to early detection, especially in those with a family history of the disease. When detected, gum disease can be treated. In its early stages, your dentist may recommend a thorough cleaning and improved oral hygiene routine. In later stages, you may be referred to periodontist. With regular dental check-ups and excellent oral hygiene, you can keep your gums and teeth in optimum health. Contact us at Dentistry on Vine to learn more. Why is Flossing so Important?? While brushing is very effective at removing plaque and food debris from your teeth, a toothbrush simply cannot effectively clean all of the surfaces of your teeth. In particular, the spaces between your teeth are difficult, if not impossible to clean properly by brushing alone. This can mean that people who brush regularly are still very susceptible to cavities and gum infections in these areas. The use of dental floss or tape once a day can clean these difficult to reach surfaces and provide you with a truly clean and healthy mouth. It takes just a few minutes per day, and the payback is a cleaner and healthier mouth. Please contact our office if you have any questions about the proper care of your teeth and gums. Any one of our staff members will be happy to answer your questions. The difference is that the materials prescribed by a dentist are generally stronger concentrations that provide faster, more dramatic and longer lasting results. More importantly, we can provide the personalized advice that you need to determine if whitening is right for you. Dr. Kit is also trained to recognize and treat any potential problems that may arise from your use of tooth whitening products. 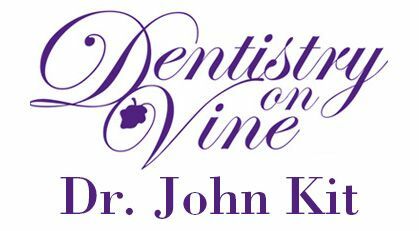 We invite you to contact us at Dentistry on Vine for more information on teeth whitening alternatives. It’s no secret that pregnancy is an important time in a woman’s life. While women are often concerned about physical and hormonal changes, these changes can also have a great effect on their oral health. Many women tend to delay the treatment of oral disease due to concerns for fetal safety. However, routine dental treatment can be performed safely at any time during pregnancy. Hormonal changes during pregnancy can result in several changes in the mouth. Reports show that the most common oral disease is gingivitis, which has been reported in 30 to 100 percent of pregnancies. In addition to examining for oral disease, dentists may notice dental erosion in pregnant women, due to increased acid in the mouth following morning sickness. Poor oral health also can also affect the nutritional intake of expectant mothers, which is essential for fetal growth and survival. Dental care during pregnancy is not only safe and effective, it’s essential for combating the adverse effects of oral disease. Ask us about receiving ongoing oral hygiene and infant oral health care while pregnant. If you can find the tooth after the accident or injury, bring it with you when you seek medical help. Pick the tooth up by the crown – this is the part of the tooth that you see in the mouth – and avoid touching the root end. Do not wrap the tooth in tissue or gauze or scrub the tooth. This will damage the delicate cells on the root needed to attach the tooth back to the gum. Place the tooth in a cup of milk (or water, if milk is not available) to keep it moist. Remember: get to a dentist as quickly as possible. The chances of saving the knocked out tooth are much greater if the dentist is seen within an hour. Recent studies have shown that by the age of three, a child is already at risk of having cavities which can be caused by something as innocent as putting a baby to sleep with a bottle of juice or milk. Along with taking our first look at your child’s oral condition, this first appointment is also largely focused on the parents and helping them to establish a good oral hygiene program and diet for the child. We believe that a child should have his or her first dental visit by the age of 3. For the nearly 9 million Canadians that have diabetes, many may be surprised to learn about an unexpected complication associated with this condition. Research shows that there is an increased prevalence of gum disease among those with diabetes, adding serious gum disease to the list of other complications associated with diabetes. Not only are people with diabetes more susceptible to serious gum disease, but serious gum disease may have the potential to affect blood glucose control and contribute to the progression of diabetes. This means good oral care habits are doubly important to diabetics. Other oral problems associated to diabetes include thrush, an infection caused by fungus that grows in the mouth, and dry mouth, which can cause soreness, ulcers, infections and cavities. To prevent dental problems associated with diabetes, one must control their blood glucose level. Then, take good care of their teeth and gums, along with regular checkups every six months. To control thrush, maintain good diabetic control and avoid smoking. Healthy blood glucose control can also help prevent or relieve dry mouth caused by diabetes. Inform us if you are diabetic. We can educate you on how to maintain optimum oral health, which can help you control your disease. “Toothache” usually refers to pain around the teeth or jaws, primarily as a result of a dental condition. In most instances, toothaches are caused by tooth problems, such as a dental cavity, a cracked tooth, an exposed tooth root, or gum disease. The severity of a toothache can range from chronic and mild to sharp and excruciating. A thorough oral examination, which includes dental X-rays, can help determine the cause – whether the toothache is coming from a tooth or jaw problem. Sometimes, a toothache may be caused by a problem not originating from a tooth or the jaw. Pain around the teeth and the jaws can be symptoms of a problem with the ears or sinuses. Since treatment for a toothache depends on the cause, visit us for an evaluation of your symptoms and for treatment options. Be sure to see us if you have a toothache that lasts longer than 1 or 2 days, or if you have a fever, earache, or pain opening your mouth. It can be overwhelming to walk down the toothpaste aisle, as there are so many choices. If you can narrow it down by flavor, then you’ve got half the battle won. But there’s still choosing the right one. Which brand is best? Does it matter if it’s a paste or a gel? When purchasing a toothpaste, especially for children, select one that contains fluoride. Toothpastes with fluoride have been shown to prevent cavities. Fluoride is a mineral that is effective in strengthening tooth enamel and reducing tooth decay. Remember to check the manufacturer’s label. Some toothpastes are not recommended for children under age 6. This is because young children swallow toothpaste, which can lead to tooth discoloration in permanent teeth. When considering other properties of toothpaste – such as whitening toothpastes, tartar control, or desensitizing – the best advice is to ask your dentist what the greatest concerns are for your mouth. Also, be aware that your toothpaste needs will likely change as you get older.